The drop wedding veil is an oval two layer veil which allows you to wear your veil with a section over your face. It creates a very sleek veil shape as there is no sewing or gathering in the fabric. 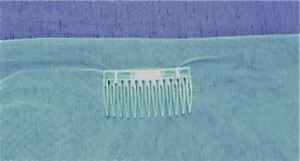 Traditionally the Drop Veil does not have a comb and is attached with straight hat pins or hair pins. Helpful Hint – we like to attach a comb or toupee clips to the veil to keep your wedding veil secure. 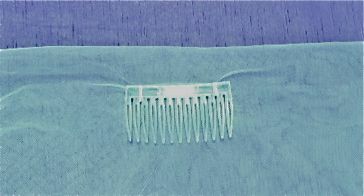 The comb or clip is sewn flat to the veil fabric.